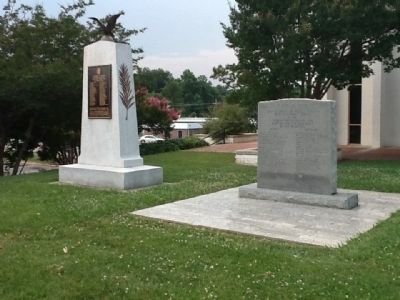 This monument honors the sacrifices of Iredell County citizens in World War I. Originally dedicated on May 30, 1928. It was erected at the end of West Broad Street. 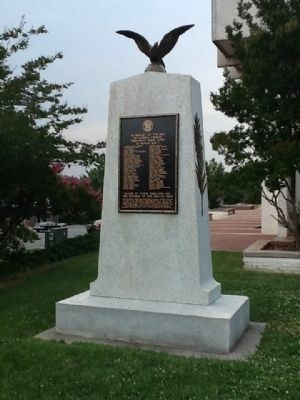 After cleaning and restoration in 2005, the monument was moved to the Walk of Honor at the Iredell County Hall of Justice. The names of four fallen servicemen who were not included on the original monument have now been added to the alphabetical list of names. Location. 35° 47.27′ N, 80° 53.17′ W. Marker is in Statesville, North Carolina, in Iredell County. Touch for map. Marker is in this post office area: Statesville NC 28677, United States of America. Touch for directions. Other nearby markers. At least 8 other markers are within walking distance of this marker. Iredell County Korea & Vietnam War Memorial (here, next to this marker); Iredell County World War II Memorial (a few steps from this marker); Stoneman's Raid (approx. ¼ mile away); Statesville in the Civil War (approx. 0.3 miles away); Iredell County Confederate Memorial (approx. 0.3 miles away); Fourth Creek Meeting House (approx. 0.3 miles away); United Spanish American War Veterans Memorial (approx. 0.3 miles away); Old Fourth Creek Burying Ground (approx. 0.3 miles away). Touch for a list and map of all markers in Statesville. More. Search the internet for Iredell County World War I Memorial. Credits. This page was last revised on June 16, 2016. This page originally submitted on July 11, 2012, by Michael C. Wilcox of Winston-Salem, North Carolina. This page has been viewed 578 times since then and 9 times this year. Photos: 1, 2. submitted on July 11, 2012, by Michael C. Wilcox of Winston-Salem, North Carolina. • Craig Swain was the editor who published this page.